Christian Boltanski, Animitas, 2014. Cast iron bells, steel, Plexiglas. 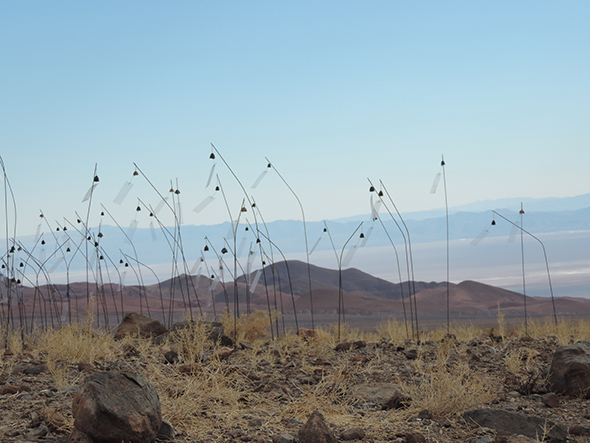 Permanent installation, Atacama Desert, Chile. On the occasion of the 20th anniversary of the Paris gallery, Marian Goodman has invited Christian Boltanski to present his latest work. The exhibition Faire-part will open on Thursday, October 22 during the week of FIAC (Paris International art fair). Christian Boltanski’s exhibition is highly anticipated. Generally considered France’s most famous and influential living artist, this will be Boltanski’s first solo exhibition of new works in Paris since his show at Grand Palais in 2010. Boltanski will use the entire space of the gallery and deploy two monumental installations on the theme of loss and disappearance. On the ground floor, he has designed a labyrinth of veils suspended from the ceiling and imprinted with barely visible photographs. The exhibition continues at the lower level with Animitas, a contemplative work composed of a video projection and a bed of cut flowers that are allowed to fade and decompose over the course of the exhibition. Christian Boltanski was born in Paris in 1944. Since the 1970s, his work has been exhibited around the world, and he has received numerous prestigious awards, including the Praemium Imperiale (2007) and the Goslarer Kaiserring (2001). In 2011, Boltanski represented France at the Venice Biennale. In 2016, the Museo d’arte contemporaneo (MARCO) in Monterrey (Mexico) will hold a retrospective of his work. Among the projects in progress, one of the most ambitious is the Archives du Coeur [The Heart Archive]: the artist has been collecting and recording thousands of heartbeats from around the world, which are then kept on the small island of Teshima in Japan. Marian Goodman has long cited a deep love for Paris as the impetus for opening her first European gallery here in 1995. Originally located at rue Debelleyme, in 1999 the gallery found a permanent home in the Hôtel de Montmor, a 17th-century Parisian hotel particulier at 79 rue du Temple. For the past 20 years, the Marian Goodman Gallery has presented exciting exhibitions by some of the most important artists, including Gerhard Richter, Giuseppe Penone, Annette Messager and John Baldessari. The gallery has also supported, and helped to organize, numerous exhibitions of artists at renowned French institutions: Giuseppe Penone at Château de Versailles in 2013; Gerhard Richter and Annette Messager at Centre Pompidou in 2012 and 2009, respectively; William Kentridge at the Louvre Museum in 2010; Christian Boltanski on the occasion of Monumenta at the Grand Palais in 2010; Rineke Dijkstra at Jeu de Paume in 2004; Steve McQueen at the Musée d’Art Moderne de la Ville de Paris in 2002; currently, Jeff Wall at the Fondation Cartier-Bresson (September 9–December 20) and Dan Graham at Place Vendôme (October 12–November 12). Gabriel Orozco in conversation with Paul Holdengräber: "Written Matter"